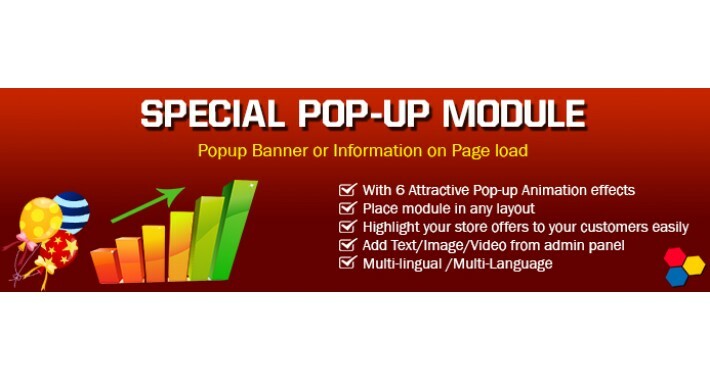 With this module you can pop-up special offers or any information when any customer clicks on/loads your webpage. You can set an image banner or html designed banner from your admin panel. This popup is layout dependent and therefore you can pop-up in any layout or in any page as you wish. Also you can set cookie if you want the pop-up only to load first time of the customer visit. You can also popup newsletter form, customer account registration form. This is responsive popup so if you have an responsive website, it will adapt to your website responsiveness. This has multi-language/multi-lingual compatibility and therefore you can set banner according to the language. You can select animation effect for each popup.